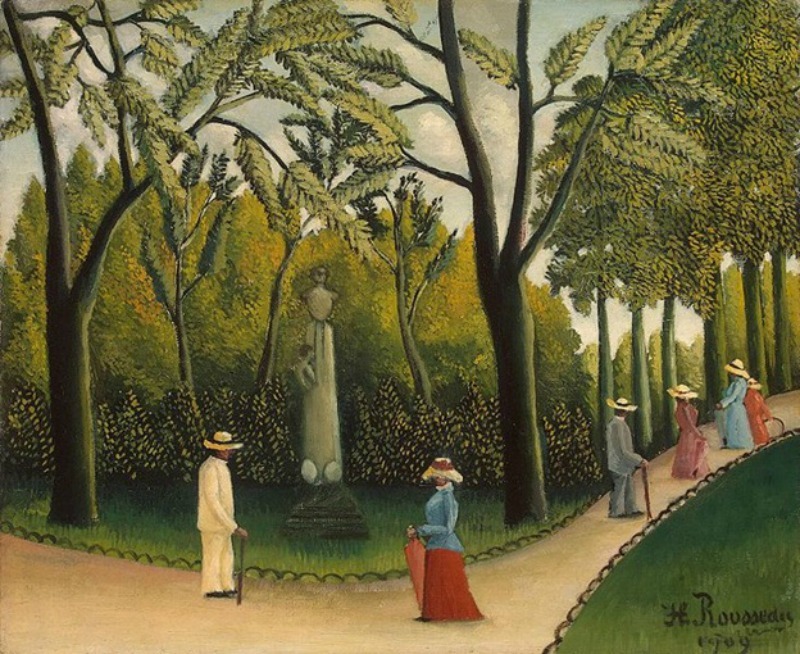 French Post-Impressionist painter Henri Julien Félix Rousseau paints in the primitive or Naïve style. He was very well-known for his many paintings depicting jungle scenes that have inspired musicians, painters and writers. He was not a painter all his life. He worked as a toll collector thus was given the nickname, Le Douanier. Although he received ridicule for most of this life, he was later acknowledged as a self-taught genius. His works, which had been labeled to be of high artistic quality, were sought after. Rousseau was not born into a privileged family. His father’s main source of income was plumbing and he had to join his father at work when he was a young boy. He studied at Laval High School as a day student but was forced to become a boarder when their house was seized due to the debts his father incurred. Although he did not do well in some of his high school subjects, his music and drawings won him many prizes. He later worked for a lawyer and studied law before serving the army for four years. Upon his father’s death, he relocated to Paris and took a government job to support his widowed mother. He was appointed as a customs tax collector in 1871. It was only when he reached his early 40s that he started to paint seriously. He retired from his job when he was 49 years old and painted full time. While he admitted that he received some sort of training from established Academic painters, Jean-Léon Gérôme and Félix Auguste Clément, he also claimed that his art teacher was nature. He was basically self-taught and his painting style is called primitive or naïve. He became more known for his paintings that depicted jungle scenes. He had never been to a jungle and he never left France and drew inspiration from Parisian botanical gardens, preserved wild animals and illustrated books. Likewise, he remembered the stories of army buddies about their experiences in a subtropical country when they were sent to Mexico. He frequently visited the Jardin des Plantes, describing his experiences in the botanical garden as entering into a dream when he saw the strange plants from countries he called exotic. Together with his exotic jungle scenes, Rousseau also painted topographical images of Paris and the suburbs. He even claimed the he invented a nouveau genre of portrait landscape by painting his favorite view of the city and then adding people in the background. The painting above, called the “Tiger in a Tropical Storm (Surprised! )” that Rousseau painted in 1891 was the first of many jungle-themed paintings that made him well known. Critics were quick to find fault with his style, which was flat and seemingly childish in approach. The paintings looked extremely innocent. Still, many viewed his paintings like the work of a child but with a great degree of sophistication in the particular technique that he favored. Although not prominently displayed, he was able to regularly exhibit in the Salon des Indépendants starting from 1886. But it was through his 1891 painting entitled Tiger in a Tropical Storm (Surprised!) that he gained his initial serious review. It came from Félix Vallotton, a young artist who said that this particular work was painting’s alpha and omega. He continued to paint for the rest of his life in his studio in Montparnasse. One other famous painting that he did from his new studio was La Bohémienne endormie or The Sleeping Gypsy (1887). He went back to painting his jungle scenes in 1905 when he created “The Hungry Lion Throws Itself on the Antelope.” Again it was exhibited at the Salon des Indépendants together with the works of younger artists including Henri Matisse. The painting entitled “The Snake Charmer” was commissioned by Comtesse Berhte de Delaunay, the mother of artist Robert Delaunay. Just before he died, Rousseau exhibited what will be his last painting entitled “The Dream.” It too, was exhibited at the Salon des Indépendants. “The Dream” now hangs at the MoMA. Rousseau died on September 2, 1910. Seven friends of his stood at his gravesite: sculptor Brâncuși; Guillaume Apollinaire (who wrote the epitaph), Armand Queval, his landlord; artist couple Sonia Terk and Robert Delaunay, and painters Manuel Ortiz de Zárate and Paul Signac. Henri Rousseau may not have an extensive collection of paintings but he had extensive influence on artists that came after him, such as Beckmann, Léger, Jean Hugo, Picasso and several Surrealist painters. The jungle vegetation in the animated film, Kirikou and the Sorceress, created by Michel Ocelot in 1998, was partially inspired by Rousseau’s works. He also influenced the poetry of Wallace Stevens and Sylvia Plath. 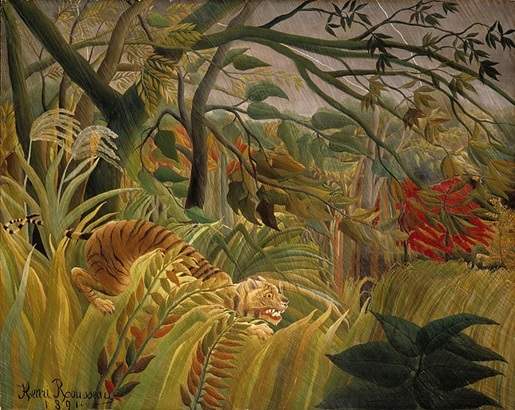 Two of Ms. Plath’s poems were based on Rousseau’s paintings: Yadwigha, on a Red Couch, Among Lilies (1958) was inspired by “The Dream” while the poem entitled Snakecharmer (1957) was based on Rousseau’s “The Snake Charmer.” The animated film, “Madagascar” drew inspiration from one of the artist’s works. Likewise, one of this works was the inspiration for the song, “The Jungle Line” by Joni Mitchell.